Labor trafficking thrives in the shadows. Its’ victims are often the most vulnerable among us—recently arrived immigrants, undocumented workers, domestic workers, the disabled, and young people. Exploited and cut off from the outside world, they’re often forced to live in inhumane conditions and work endless hours with little to no pay. During National Human Trafficking Awareness Month, to help bring awareness to this often overlooked injustice, John Jay College welcomed Fainess Lipenga, an anti-trafficking survivor and advocate, to share her experiences. Lipenga was joined by Martina Vandenberg, Founder and President of the Human Trafficking Legal Center, who helped explain the problem from a legal standpoint. 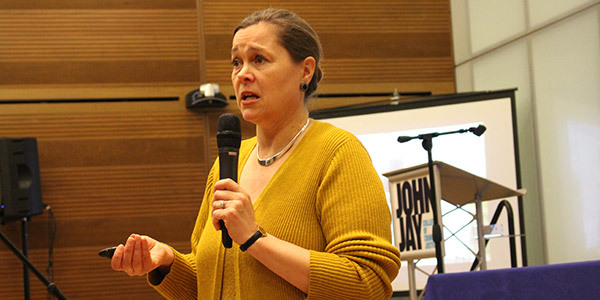 On January 31, in John Jay’s Moot Court, each of them held the audience’s attention in their own dynamic way, with Lipenga painting a picture of her experience from her native Malawi to Maryland, and Vandenberg breaking down trafficking myths with pop culture references and gripping labor trafficking examples. Even though the event was held on one of the coldest days this semester, many John Jay students, staff, and faculty members stayed after their presentations for a gripping Q&A session. Their stories perfectly encapsulate why John Jay’s justice-focused mission is vital for an equitable society. Fainess Lipenga is a woman on a mission. Determined to tell her story and help those victimized by labor traffickers, she began by reminding the audience that she is no longer a victim. “I don’t see myself as a victim,” said Lipenga. “I survived modern slavery. I’m a leader that has a story to tell. I have work to do in order to help others.” Lipenga worked as a domestic worker for a diplomat in Malawi for two years. 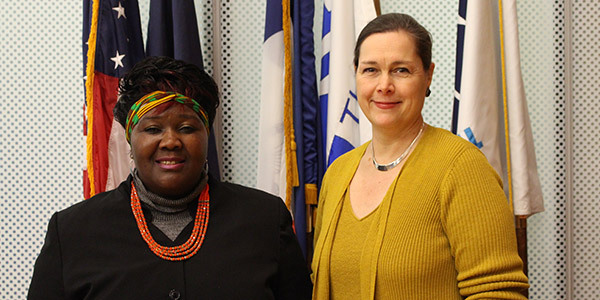 When her employer was offered a diplomatic position in Washington D.C. she convinced Lipenga to go with her, promising Lipenga the chance to receive a formal education and earn more money in order to help her family back home. “You can imagine how excited and grateful I felt when I was made this offer. I dropped out of school because of financial hardships. I needed to help my family. I worked with her for two years and everything was fine. There were no red flags.” With her family’s financial security in mind, Lipenga accepted the opportunity and was asked to sign a contract written in English, a language she didn’t speak or understand at the time. Once in the U.S. however, Lipenga’s life took at unexpected turn. After fleeing from her trafficker, Lipenga found herself in a shelter and was finally able to call her mother. After three years of not hearing her voice, her mother, elated with joy exclaimed, “Oh my God, my child, you are alive! All this time I thought you had died. What happened?” Lipenga would go on to tell her mother, as well as others, including Vandenberg, the story of her captivity. With guidance from Vandenberg and her organization the Human Trafficking Legal Center, Lipenga was able to secure her U.S. citizenship and seek out justice in her case. In 2014 her pro bono lawyers filed and won a civil complaint against her trafficker where Lipenga was awarded $1.1 million in damages. Martina Vandenberg gives the audience some gripping examples of labor trafficking in the U.S.
One of the goals of the Human Trafficking Legal Center is for every trafficking survivor, if he or she wants one, to have a pro bono lawyer standing with them. When a worker is held in forced labor they have no power. “The point of the Human Trafficking Legal Center is to upend the balance of power so that survivors of forced labor can actually hold their traffickers accountable,” says Vandenberg. If you’re a victim of human trafficking or suspect someone is in need of help, you should call the National Human Trafficking Hotline at 1-888-373-7888—its confidential and available 24/7.